no monkey dance for you? I think it’s a great chart – very useful, thank you. A nice summary, and works great as a check list. Nice chart – well done. One thing I would to add under the keyword research is stakeholder interviews. hi Giovanna…..Very useful chart. Keep up the good work. Hey thanks for this chart. It’s really cool and I like how the links are for all different sites. You put in a lot of work and it came out great! Hi Giovanna, great chart. It clearly lays out key steps for PPC marketing. One thing it demonstrates in particular is that PPC campaigns require strategy as well as execution. If you don’t mind my asking, which flow chart software is this based on? Thanks! This is really helpfull! Great chart but i would also add Search Query Reports at a later stage to identify new opportunities. We used a program called SmartDraw and it’s quite handy when addressing complicated material. Hi Giovanna, a very useful flow chart explaining the PPC marketing exhaustively. Thanks for sharing. Mind if I share it with my team? Awesome chart…I’ll have to add this to my MindJet workflow charts, then have it printed out really big. Was sent here from Jeremy Palmer’s Blackink list…I know how it is with a new blog…can be rough, but we’ll get there with great content! Very nice resource. Thanks for sharing. One suggestion, I would recommend putting your website address on the image and pdf (as a link) so that in the future when we refer to it we’ll remember where we got it from and can easily go back to your site. nice work! I’m another BIP2 student. I’ve just downloaded some mindmapping software to help me get ideas sorted. I like your blog template, very web 2.0, I think. Nice chart. I was in the middle of putting one of these together myself so now I can stop! I especially like the idea of clickable boxes that offer more advice/explanantion. Great Flow Chart! Thank you so much! 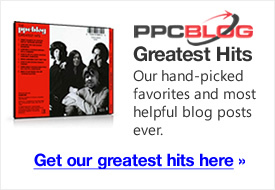 PPC is very Tricky business, esspecially for someone without experience. This is a perfect companion to a PPC Guide or course. Good guidelines. Thanks for putting that together! Is there a way you could include the websites you linked to in the PDF version? Great chart and thanks for doing all the leg work for us aspiring marketers! Great resource. Thanks for sharing. I’ve forwarded to the PPC / SEM team in my office. Great chart, especially useful for those new to PPC. I agree with the above comment about including search query reports and would also add ‘negative keywords’ plus ‘ad sceduling’. Nice to see little Louis ‘The Link-Framer’ Hapless (sorry, Halpern) likes this – I am sure he’ll be able to doctor it so he can use it for his dodgy SEO antics.